Computational Chemistry Highlights: How Electronic Dynamics with Pauli Exclusion Produces Fermi-Dirac Statistics. How Electronic Dynamics with Pauli Exclusion Produces Fermi-Dirac Statistics. A very interesting preprint by John Parkhill from the University of Notredame and his group provides a solution for a long-standing theoretical problem: Many of the quantum master equations that treat electron-phonon interactions fail to reach a Fermi-Dirac distribution at long times. For example, Ehrenfest dynamics is one of the usual suspects for this behavior. By employing a combination of time-dependent perturbation theory and the extended normal ordering theory of Kutzelnigg and Mukherjee, Parkhill and his co-workers arrive to a novel master equation. 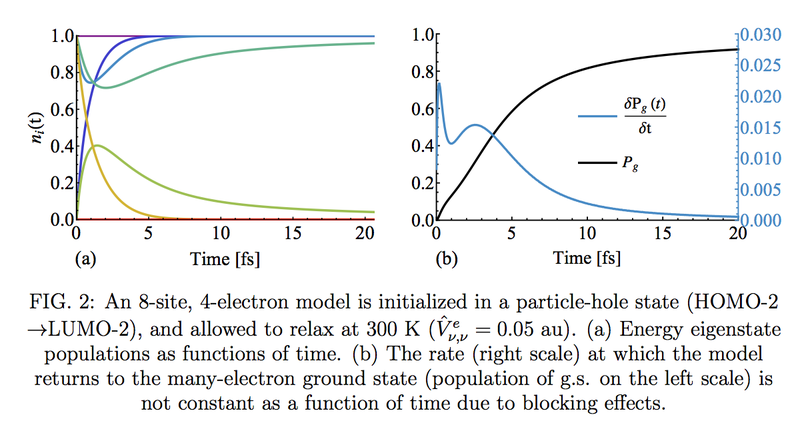 The results from this work show that the Pauli principle "blocks" electron relaxation and slows it down, and in addition it leads to a time-dependent relaxation rate. The plot below shows the correct asymptotic relaxation of a double excitation in a model system and the plot in the right shows a time-dependent relaxation rate. an immediate follow up.". The contributor is looking forward to it.